NerdWallet’s How Do You Do Money? series asks people from various walks of life to share their attitudes and approach to personal finance, with the goal of bringing transparency to discussions surrounding money. In this installment we speak with Josh Michtom, a 36-year-old public defender living in Hartford, CT. This is how he does money. What do you do for your main source of income and how did you get into that line of work? I’m a lawyer – a public defender in the juvenile and child protection unit. After college I taught adult ed. for a year in Bushwick, Brooklyn, through AmeriCorps, and then I was just looking for some kind of teaching or doing-good/fighting class warfare type of job, and I ended up being the Grievance Officer for the New York hotel workers’ union. That meant doing a lot of investigating to help union members who had been (presumptively) unjustly fired or suspended, and those who thought they weren’t getting paid according to the union contract. I ended up working closely with the union’s lawyers, preparing cases and witnesses and such, and I thought, “I may never be the greatest legal mind, but I could be OK, and the world could use more socially conscious, Spanish-speaking lawyers who actually know how to talk to poor people in a way that builds trust and puts them at ease.” Also, my girlfriend of the time urged me to go to law school when she went to graduate school. So I went to law school, and started out as a public defender in adult court in Cambridge, Mass., while my girlfriend, who had by then become my wife, finished her Phd., and then she got an academic job in Connecticut, so we moved here and I ended up finding work in the juvenile / child protection realm. I started at a nonprofit law firm focused on poor children, and I ended up really enjoying working with kids and families, and it became my specialty. So that’s how I ended up doing this. I really like what I do. Sometimes I wish I could play music and write and make art for a living, but maybe I actually enjoy those things because I can do them without worrying about doing them profitably. That makes sense, plus it is great you do something you enjoy. About how much do you earn before taxes per year? $75,000, including salary, freelance Spanish translation work, and a few bucks here and there from selling art and writing. 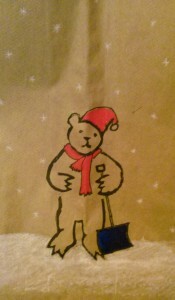 One of the lunch bags Josh decorated for his kids. Yes. I know that some unforeseen catastrophe would wipe me out, but that’s true of most people. So much debt. I have about $75,000: $13,000 in back taxes from one year when I got laid off because of a state budget crisis and worked for myself and couldn’t at all afford (given how much less I was suddenly making) to pay estimated taxes, and the rest from law school. Do you think incurring that debt was worth it? Yes and no. I like the work I do as a lawyer, so I don’t mind having incurred debt to get to do it, but there are ways I could have come away from school with less debt. I mean, I chose my school exclusively based on how much aid it offered, even though another option offered less but had public service loan forgiveness, which would have been better for me. The same goes for the tax debt: I couldn’t pay it because I was living beyond my means, which was dumb. Um, to be saving? I’m on sort of a five-year plan right now. I got divorced two years ago, and my ex and I agreed that she would keep the house because (a) I really don’t like the suburbs, (b) we could have broken even at best if we sold it then, and (c) we figured it would provide some needed continuity for our kids if they could stay in the same school district and spend half their time in a house they knew. Since she is bearing a way bigger tax burden that benefits the kids, we agreed I’d subsidize her mortgage for the first few years, figuring that after that, the kids would be able to deal with a bigger change if need be, and my ex could regroup financially and either keep the house or sell it. So, when that period of mortgage subsidy ends (within a year), I’ll start using that money to pay down all my debts much faster and then start contributing to my long dormant IRA. How was the topic of money approached in the home(s) you grew up in? I was in two worlds: for a while, one parent seemed to have a very comfortable, middle-class existence, which I only found out much later was heavily subsidized by grandparents, and the other parent was quite poor, periodically unemployed, and perennially scrounging. Later, the middle-classish parent also fell into long stretches of unemployment. I was definitely conscious of money, of the lack of it at one parent’s house, and of the limitations that a lack of money puts on life – not in the sense that I realized how much more barren life is without the symphony and the ski slopes or something like that, but in the sense that at one parent’s house, possible eviction hovered close and I knew from surplus powdered milk, food stamps, and government cheese. That said, there were never any explicit lessons about managing money or savings or anything like that. How do you think that affected your attitude money and your personal finances? My approach to personal finances has always been chaotic and lousy (like my parents’), but I have been saved by my attitude toward money, which is that I don’t feel like I need a lot of it. One thing my poorer parent did for me was teach me how to enjoy simple things, how to be content without a lot of things or a big apartment. Right now, I make more money than either of my parents ever did, and the only things that keep it from feeling Iike an actual fortune are (1) the debts that remain from my married period of living beyond my means and (2) the notion that my two children will someday want to go to college. When I first left home, I worked and was frugal, and things went well for me and I was happy. Then, as mentioned, I fell into a period of aspiring to an upper-middle-class lifestyle that I just couldn’t afford. Now I’m pretty much back to how I was initially. It is great that you’re back to being happy with your lifestyle and doing well! What ideas related to money do you want to pass on to your children? Mostly the same ones I got from my poorer parent – that it’s important to find joy and contentment in simple, accessible things, and to recognize that the luxuries of middle class life should be appreciated but not expected. My kids (two boys, seven and nine) live with me half the time, and I try to teach them this by exposure and example: we live in a poor neighborhood (and not the kind that’s gentrifying or on the up-and-up) and do a lot of local stuff that’s cheap or free. We spend a lot of time making art in the house or playing music (either at home or with my band), and just walking around the neighborhood. I try to strike a balance between sensible frugality (not eating out often, treating a trip to the movies or the toy store like something special and a bit rare) and spending a few bucks to enjoy simple pleasures (the ice cream truck, pastries from the local Puerto Rican bakery, a couple of rides at the carnival when it sets up for the weekend in our neighborhood park). Saying goodbye to suburban home ownership and renting a spacious, modestly priced apartment in the ghetto. What monetary investment do you regret the most and why? Home ownership. My ex and I bought at the top of the housing bubble, following this inexorable script of financial milestones, even though a clear-eyed calculation should have told us that it was beyond our means. We were lucky in that we didn’t end up underwater, but it was a lot of years of pouring all our money into an asset of declining value when we could have lived more cheaply and just as happily (maybe more so) and saved a lot of money. What does financial stability mean to you? Not having to use a credit card ever. I suppose it should mean having a clear vision of how I might ever get to retire, help my kids with college, or weather some sort of prolonged illness. But for now, I’m glad just to be living within my means. See above. Also, the fact that when I found I owed $2400 in taxes this year (freelancing! ), I actually had the cash on hand to pay it. Barely, but still. What is a question that you have related to your personal finances? Advisors on our Ask an Advisor platform have some great answers on how to pay off law school debt. NerdWallet also has some tips on how to save for your children’s college costs. Do you need help getting your money in order? Tell us why you need a financial makeover and you could win a customized financial plan from a Certified Financial Planner! Details here.